The image below was originally created by Forrester Research and illustrates the use of social media in simple terms. 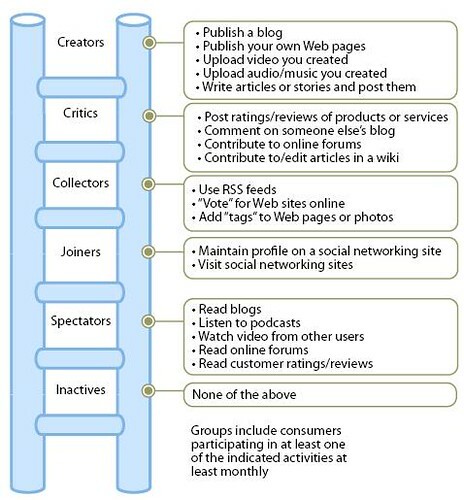 Each step on the ladder represents different levels of consumer participation in social media. To become a participant on one of these rungs, a person needs to perform at least one of the listed activities next to it, monthly. The term, “social media” is all the buzz and companies are still trying to figure it out. Whether it is products, programs or services, social media has an important role in the marketing space. There are strategies that can be implemented around it. It feels good to help others understand the task at hand and appreciate the information. Some of us have acquired the tools and understanding of the process. We have figured out how to educate others about social media. There are so many people who aren’t quite sure what it all means and how it ought to work. That is what motivated me to start this blog.